After reaching incredible speed on their newly acquired ship, the Planeshifter, the crew found themselves transported to the Plane of Water. Upon arriving, they heard strange noises off the starboard deck and found several humanoid creatures in the water battling large tentacles. 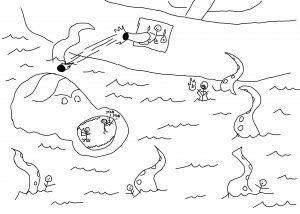 Their ship was thrust into the battle as the kraken’s tentacles rocked the boat and knocked several of them into the water. 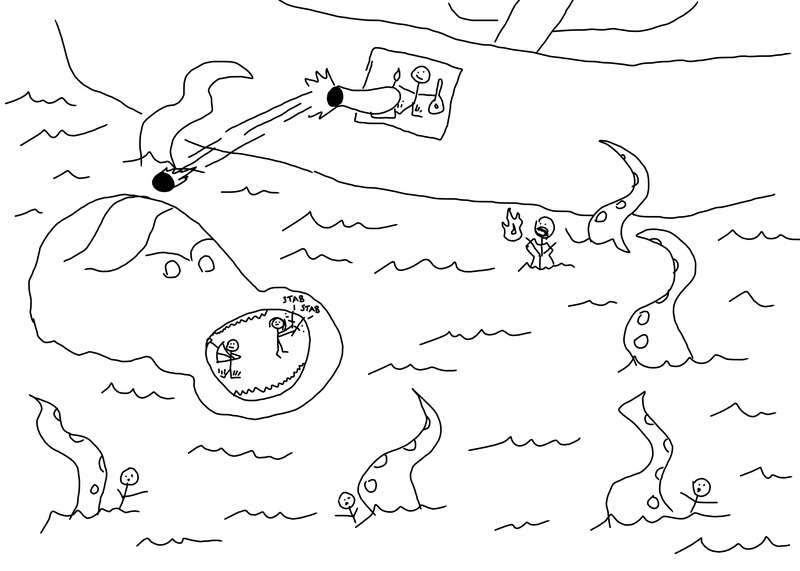 As attacks against the kraken seemed mostly ineffective, one of the Ridgeoneons charged valiantly into the creature’s mouth. Jasp and Korbin joined her, and attacked the monstrosity from inside, while Nayte fought off several tentacles and Minis launched a cannonball at the beast. Sufficiently wounded, the creature retreated to the depths. The Ridgeoneon leader, Quelteth, thanked the party, and invited them to join her visiting their underwater city.